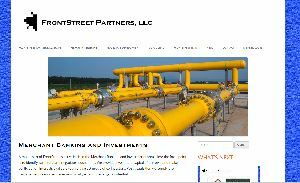 FrontStreet Partners is a leading private equity firm with offices in Houston, Texas and Darien, Connecticut. Since its formation in 2001 it has sponsored acquisitions in the upstream, downstream and midstream sectors of the energy industry. Through its real estate development arm it has acquired a US and international portfolio of properties. Unlike the typical fund organizer, FrontStreet is an active manager of every business it acquires. The company's Managing Partners buy a major financial stake in each of its sponsored investments. Because of this FrontStreet investors can be confident that the only projects they will be invited to invest in are ones that the Managing Partners have determined to be promising enough for their own portfolios.